“This is a long testimonial but I wanted to write it for anyone who may be considering using Paws and Possibilities or for those who may have concerns about adopting a rescue dog. 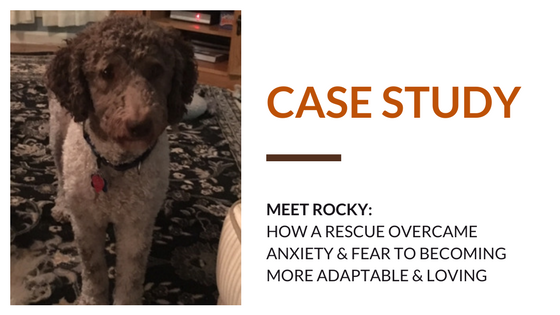 We brought Rocky home on August 3rd and to say that he was fearful and anxious is an understatement. We couldn’t touch or pet him. He was afraid of everyone and everything and any change would set off his anxiety. I couldn’t take his picture as he ran away and hid in fear. He was a little over 2 years old and we were his 5th home (not including that he had been at the rescue twice and lived on the streets for a couple of weeks). A requirement for his adoption was that we had to have another dog and we had Riley, who is only a few months older than him. I had taken Riley to Paws and Possibilities 2 years earlier and we attended Lauren’s class. I paid attention and did everything Lauren taught us and Riley learned quickly – all the basic commands, no bolting out the front door, no jumping on people, no counter or trash surfing and more. It was such an easy system to use on any issues that arose. I also paid attention to what she was helping others in the class with, so when adopting Rocky I remembered there was a fearful dog in Riley’s class and what she had taught them. I starting using what I remembered immediately with Rocky and within a month he had bonded with me, was following me around everywhere and coming to me for chin scratches! I quickly realized that he knew zero commands and didn’t even know how to learn or play. I set up a consultation call with Lauren and decided to start taking him to classes as I needed him to build some security away from Riley and strengthen his bond with me. He was surprisingly relaxed in the classes. We didn’t participate much with the others in the class but used it as an opportunity for him to build his confidence around strangers. Caylen and Lauren came up with a method for me to teach him how to learn. New issues came up during the 6 weeks and each time, Caylen and Lauren helped me address them. We have had Rocky for 5 months now and he has come a long way! He adapts to change easier and here he is, no longer running in fear from the camera, and with Riley practicing his “sit” and “down/patience. I could not have done this without their help!